AP Forest Department Previous Papers: The Andhra Pradesh Forest Department is one of the administrative divisions of the Andhra Pradesh Government. Its main function is the protection, conservation, and management of forests in the state of Andhra Pradesh. In today's world, the conservation of forest resources is very important. As a result, the need for forest department employees is increasing every year. There are various divisions like Forest Range Officer (FRO), Forest Section Officer (FSO), Forest Beat Officer (FBO), and Assistant Beat Officer (ABO) available in the Forest Department. The recruitment process for the jobs mentioned above will be based on a written exam and an interview. The written examination consists of three sections (Essay, General Knowledge and Mathematics). GK and Mathematics contain 50 questions for each part and carries 2 marks for each question. General Essay carries 20 marks. The total number of marks for the written exam is 220 marks. 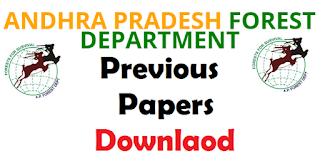 Andhra Pradesh Forest Department previous year papers (PDF files) of various departments like Beat Officer, Range Officer, Section Officer are available for download here. Those interested in working with the AP Forest Department should be well prepared for the entrance exam. Please go through the below links for previous year question papers of (Forest Beat Officer, Assistant Beat Officer, Forest Range Officer).